Yes, *YOU CAN HAVE IT ALL* living in this EXPANDED ST. SIMON Premier home in VILLAGE OF BRIDGEPORT AT LAKE MIONA! This stately 4 BR/3 BA/2.5 Garage home has NO BOND & lovely CURB APPEAL w/ double LEADED GLASS front doors, STAMPED CONCRETE DRIVEWAY/WALKWAYS, & MATURE LANDSCAPING w/ CONCRETE CURBING. Situated on an OVERSIZED LOT in the heart of The Villages, it is a 5 min golf cart ride to PO boxes, Bridgeport Village rec center, & championship golf at Palmer Legends Country Club. Lake Sumter Landing w/ its FREE NIGHTLY ENTERTAINMENT and CR 466 commercial corridor w/ EVERYDAY CONVENIENCES are only 15 min away. 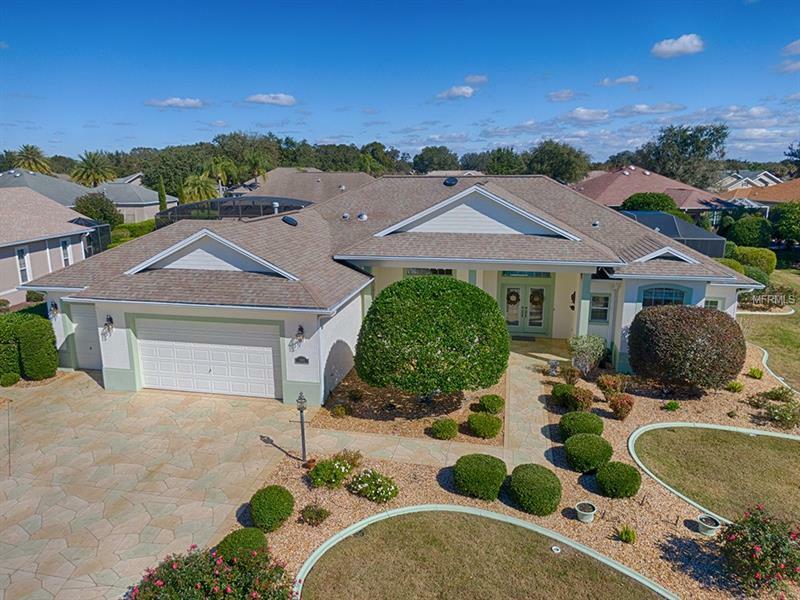 After a full day of The Villages leisure activities, you can relax in your PERSONAL SANCTUARY that has a SCREEN ENCLOSED, SOLAR HEATED, SELF-CLEANING, SALT WATER POOL & a GAS HEATED, IN-GROUND SPA in an EAST FACING LANAI w/ coveted REAR LANDSCAPING PRIVACY. The interior of home has impressive 12â ceilings in main LA, flowing SPLIT BR floor plan, & sports NEUTRAL FRESH PAINT. Kitchen is a chefâs dream w/ large ISLAND, adequate work space, & storage galore w/ SILK, STEPPED CABINETS. Family Room has free standing FIREPLACE & SLIDING GLASS DOORS to pool area. Spacious 4th BR (no closet) has FRENCH DOORS & an ENSUITE BATH, which has exterior access & serves as a POOL BATH. MASTER BR SUITE has large HIS-N-HERS CLOSETS, SLIDING GLASS DOORS, and ENSUITE BATH w/ GARDEN TUB, WALK IN SHOWER, & abundant NATURAL LIGHT. With a pre-market home inspection completed, this home is MOVE IN READY! Quick close possible!